This is without doubt one of my favourites and probably 90% of German children love this food. It is not so much something that was baked in the oven but in a pan. German pancakes, which are similar to French Crépes but not as thin. There are many variations to pancakes, this is only one version. The recipes comes from my mother and I assume she got it from grandma. If you like thin pancakes, you want a thin dough. However, if you prefer your pancake a bit thicker, make sure you use a bit more flour. Heat your pan. I recommend a pan that has low edges. We have a special crepes pan that has almost no edge. Add a little bit of oil and make sure it is hot before using. Take a ladle full of dough and pour into your pan. When the upside of the pancake is not liquid anymore you can flip it. Brown both sides and stack on a separate plate. Serve warm. I recommend you DO NOT use too much syrup (actually, no syrup at all). These German pancakes DO NOT soak up liquid like American pancakes. Germans eat their pancakes with sugar, marmalade or jelly, sugar and cinnamon or Nutella. There are those that like them more savoury with cheese, ham and those sort of things. That was never really done in my family but surely you can do that. When filling your pancake make sure you still can roll it up. 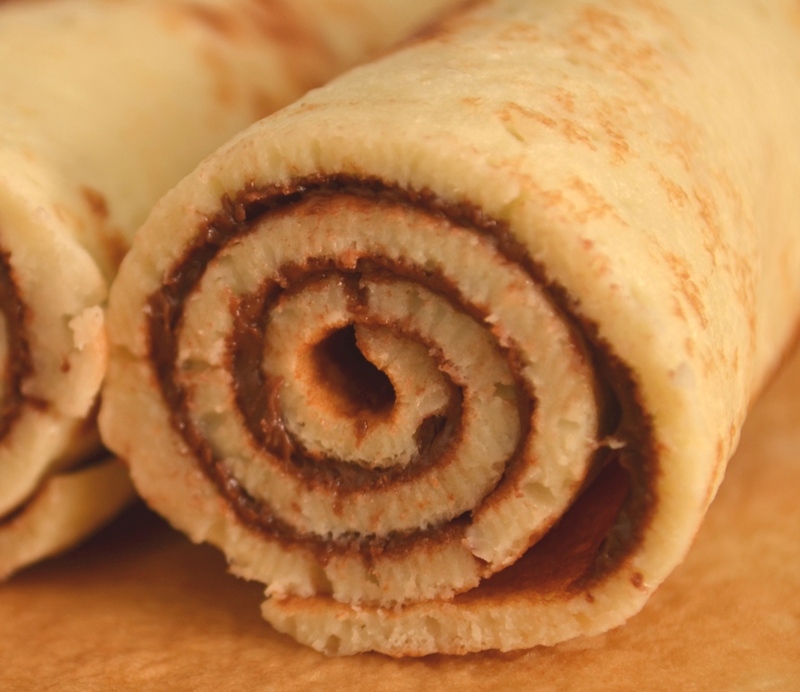 Unlike American pancakes we roll and cut them up. Makes it easier to eat them because they are usually somewhat larger than American pancakes. Posted in Top Menu and tagged chocolate, dessert, pancake, recipe. Bookmark the permalink.